The death of a cyclist last month, struck by a pickup truck at West and Chambers, is prompting the city to consider changes to what is now a dangerous confluence of bikes, pedestrians and turning cars. 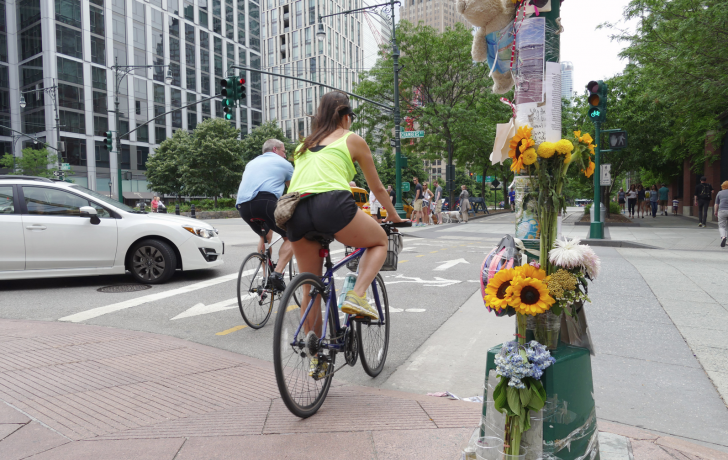 On June 11, around 7:50 p.m., Olga Evgleska Cook, 30, was riding south on the bike path along West Street when she was hit by a truck turning right onto Chambers Street. Both had a green light. The driver, who continued on into Battery Park City before stopping several blocks away, was arrested and charged with manslaughter, leaving the scene of an accident, failure to yield to a pedestrian, and driving while ability impaired. Many say the intersection is especially dangerous because a single green light applies to everyone: pedestrians, bike riders and turning cars. In addition, it is the first intersection that cyclists encounter after a long stretch of the bikeway. Late last month, Community Board 1 passed a resolution calling on the city to install right-hand turn signals at all southbound intersections along West Street, between North Moore and Liberty. Dep. Inspector Mark Iocco, commanding officer of the 1st Precinct, said the NYPD is working with the DOT to come up with “engineering recommendations” to make the intersection at West and Chambers safer. Cops are also stepping up enforcement at the intersection, he said. Following are collision and violation statistics for the intersection of West and Chambers for the first half of this year, provided by Det. Rick Lee, a 1st Precinct community affairs officer.